The Hotterdog products are sized according to three measurements. 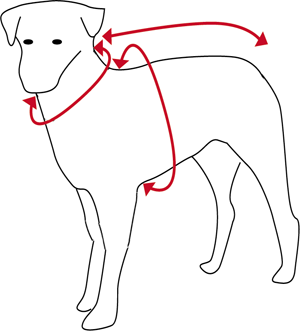 The diagram to the right shows how to measure your dog. The various sizes available are summarised in the table below, together with suggested breeds for each size. Please note this information is for guidance only. The Hotterdog products fit differently than the Hurtta dog coats and should be measured differently (along the back from collar to tail). Please be aware that this is only a guide. Best way to determine what size you need is to measure your dog. The Equafleece products are sized according to four measurements. 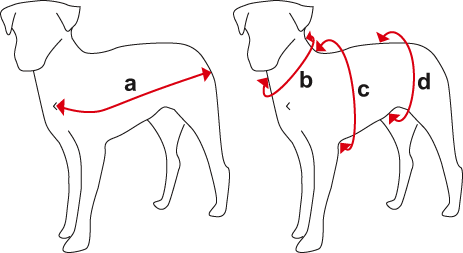 The diagram to the right shows how to measure your dog. The 'a' is the main measurement and is taken from the breastbone in front, along the side to the base of the tail. As a rule of thumb, dogs are about the same measurements 'a' as measurement 'c', so you'll just need to pick the size that correspond with measurement 'a'. If you have a slim dog (measurement 'c' being 2" smaller than measurement 'a') there is a Slim version available in the Jumper/Sweater that can be special ordered. However most dogs are fine with the standard sizing. If your dog has a very deep or wide chest, you may have to go up a size. Please contact me at katja@eurodogdesigns.com for recommendations. I generally recommend going up a size from the above, for the Jumper and Tankie as they run a bit small. Girl dogs can wear a larger size than the boys as the don't have to worry about peeing on the underside of the fleece. So to sum up: If you dog has a measurement 'a' that is 22" then I recommend size 22" in the Fleece Dog Suit and size 24" in the Jumper and Tankie. The Equafleece products fit differently than the Hotterdog and Hurtta dog coats, and should be measured differently. to Hotterdog and Equafleece sizes. Please measure your dog for the most accurate sizing.